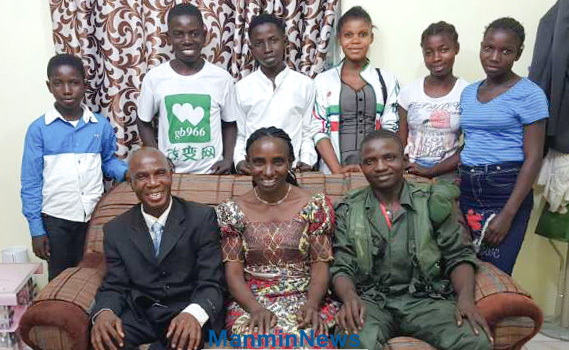 "God protected my son from death, and blessed me to get promotion!" I used to be a Muslim but in November 2010, I was guided to Manmin by my brother and became a sheep of Manmin. I was so greatly blessed through Senior Pastor Dr. Jaerock Lee's sermon "The Message of the Cross" and delivered the message to my family. Now all my family members are sheep of Manmin. Since we met Manmin, we have been protected in the shepherd's space and received many blessings. Two years ago, my first son went into the army. After the training period, he was dispatched to Bunia in DR Congo. This area is close to the rebel army base. During the battle with them, his senior soldier was shot to death and the other soldiers in his team were in a bombardment. However, my son was the only one to be kept safe. Hallelujah! He was under the protection of God because my church's pastor prayed for me and my wife with the handkerchief on which Senior Pastor had prayed. Afterwards, my son was moved to an army base under the presidential authority, and in April 2017 the department sent him to Kasai, an area of rebellion. Before, all policemen that were dispatched to the area were all killed in the area. However, my wife and I sent our prayer request to Senior Pastor and received his prayer transcending space and time. And my son was able to come back to Kinshasa after finishing his duty. As I experienced the amazing love of God, I came to be avid in living by His words. I work as a policeman and belong to the planning department. For the past several years, because of my seniors' disruption, I did not receive any extra pay including pay given when I performed hazardous duty. However, I tried to act in goodness, serve others, and did my best in everything. I prayed with belief that God would surely bless me, and stayed patient with thanks even though I was in financial difficulty. In the meantime, in August 2017, I received Senior Pastor's space-and-time-transcending prayer while participating in Manmin Summer Retreat on GCN. After the prayer, I was blessed to get promoted to Manager of Planning Department.